We’re painting our house exterior Iron Ore by Sherwin Williams. That’s right, Iron Ore. Don’t try to sass me and tell me it’s too dark (ahem, Zach, ahem) because I’ll tell you that you better be glad it’s not Tricorn Black. I think the Iron Ore is going to be lovely and is going to achieve all my goals of rustic, refined, modern bliss. And if I’m wrong then I’ll allow you to say I told you so. I’ll never admit it, but you can say it anyways. Here are the dark exteriors that influenced my decision and gave me the courage to go for it! 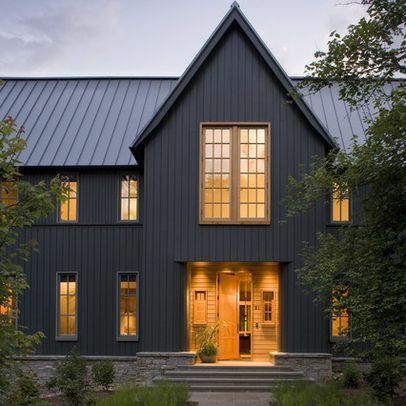 If you also love dark exteriors I love Urbane Bronze, Gauntlet Grey, Grizzle Grey and Kendall Charcoal too! I for one love the dark exteriors, sleek and modern but also rustic and understated. The dark paint with the copper fixtures is absolutely stunning.